Take advantage of cheap flights to Split to reach your holiday destination! Getting to Croatia is easy, there is a wide choice of airlines offering bargain round trip flights. Landing on Split airport is easily the quickest way to reach Split or any of Central Dalmatian islands. There are numerous airline companies with flights to Split all year round, and this guide should give you a nice overview of major airlines you can travel with. Most important thing for majority of air travelers isn’t actually the airline, but rather the ticket price, so for your convenience I included a search form below which looks through over a thousand airlines and travel agencies to show you cheapest prices. Search form not displaying correctly? Search directly on JetRadar or Wego! There are not many direct flights during the whole year, but in period from April to October there are quite a few low-cost flights. In this period you will find several carriers that fly directly to Split. The most frequent flights are from UK to Split. The flying time from the UK to Split is between two and two and half hours, depending on where you are flying from. Croatia Airlines (National Company) have flights in summer from both London Heathrow and London Gatwick. Check their online offers. One of the carriers with the highest number of flights is Easyjet. In 2013 Easyjet had daily flights from London Gatwick from the end of April to early October, from London Stansted three times a week from late May to early October, as well as three flights a week from Bristol to Split. Other carriers like Norwegian offered flights once a week (on Saturdays) from London Gatwick to Split from early April to the end of October. Monarch carrier was also a newcomer in 2013 with flights from Birmingham to Split, three times a week from late May to late October. Jet2.com had a twice a week flight from Manchester to Split from mid May to early October, and once a week flight from Leeds Bradford. Wizz Air had three flights per week from London Luton to Split from mid June to mid September. Tui Airways flies from multiple UK airports to Split, and also Dubrovnik and Pula. If you are traveling from Germany, here you can find information about cheap airline companies flying to Split. Germanwings is the trustworthy carrier that makes a part of Lufthansa group. It departs from all principal German cities like Köln, Bonn, Stuttgart, Berlin, Dortmund and Hannover to Split airport. Airberlin is flying from Düsseldorf and Nürnberg. It is the second largest German airline. Hamburg Airways is a German airline based at Hamburg, operating on prearranged and chartered holiday flights on behalf of tour operators. It flies from Erfurt, Frankfurt / Main and Friedrichshafen to Split. One might expect to find more flights to Croatia from Italy than from any other European country, but unfortunately there are not that many airlines flying to Split. Croatia Airlines keeps a regular flight (all year round) from Rome – Split – Rome, but prices are rather high as it is a direct flight. Easyjet is also flying to Split from Rome and Milan. It offers very low airfares and the first scheduled flight will start from June 2015 and this route will be on sale up to August 31 2015. As an example, the lowest fare starts from € 57,49 one way on June 29. Many of you will be glad to know that there is a flight to Split from Venice. A new privately owned Volotea carrier keeps this connection only in high season. As a convenient alternative you can also consider taking a ferry from Italy to a number of Croatian destinations including Split. I didn’t forget giving you some more flights information from other European countries that can be useful to reach Split town. From Czech Republic there are flights from Prague to Split. Czech tourists are traditional Split and Dalmatian islands holiday visitors. Smartwings carrier has very competitive prices in period from May to September. EasyJet runs the flights from Amsterdam to Split. 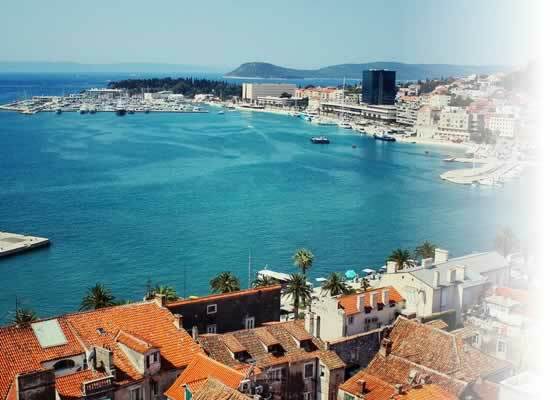 Most cheap flights to Split are available from June to August. Flights from Copenhagen to Split Croatia start in April. The Cimber carrier had really low-cost prices starting from € 63,30 for one way, but they went bankrupt a few years ago. I’m not aware of any direct flights from Denmark to Split right now, but feel free to check on WeGo to see if there are any. Norwegian is the third largest low-cost carrier in Europe and the second-largest airline in Scandinavia. Norway to Split flights include departures from Oslo, Bergen, Trondheim and Stavanger to Split (and also Dubrovnik). After a break of twenty years, one of the most popular internal routes in former Yugoslavia has been re-established, with Croatia Airlines following by Serb national carrier, Air Serbia! Split flights from Serbia are usually only from Belgrade. Vueling is the main flights carrier from Spain to Split. There are two Spanish cities with connections to Split, Barcelona and Madrid. If you are looking for flights from Switzerland to Split than EasyJet keeps connections to from Geneva and Basel. Flights from France to Split are available by the same carrier, and you can depart from Paris’ Ch. de Gaulle airport to Split.